"Come as you are and Get as Dirty as you Like"
The ultimate un-timed fun run where all you wacky-racers get the chance to bring out the kid in you again. Come run, crawl, slide and roll around in the dirt. The Haval Port Elizabeth Muck Run is a fun obstacle course over 5km and suitable for everyone - If you can laugh, then you are ready for it. No special training required, no special equipment required. Come have a BLAST in the mud and 10+ obstacles that will get you as dirty as possible. The event is built for laughs, but we’re also on a serious mission: to support people less fortunate than ourselves. Bring all your unwanted clothing and donate this together with your dirty race kit and we'll ensure it goes to a worthy cause. There’s no better way to experience the Haval Port Elizabeth Muck Run and the Mardi Gras-style joviality than by forming or joining a group. Believe us, you’ll want your friends and family around to bear witness to your mucky exploits and athletic slapstick. That’s why over 70% of participants are in a group. So, don’t wait, start a group today and claim your zany or “punny” group name and dress the part (great prizes for best dressed teams and individuals). Entry fee discounts are also offered for groups of 5 or more people. 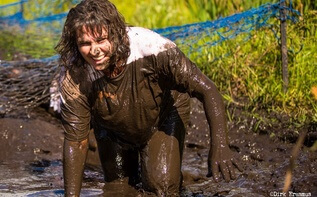 After getting dirty on the course, go to the clean-up station for a rustic shower and splash in the pond and then head over to the Muck Festival area to grab some grub and decide, once and for all, who had the most epic spill of the day. Children get to join in the fun with a Rotary managed play area. Check out the info page for all the dirt. The Haval Port Elizabeth Muck Run supports local charity by encouraging all participants to donate unwanted clothing items. BRING ALONG YOUR OLD CLOTHES on race day - anything goes, so please raid that cupboard and haul out anything you haven't worn this year and donate to a worthy cause. 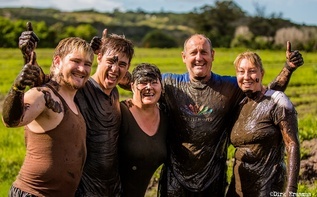 We have the greatest Muck Run venue in the City by way of Dawson's Farm on the corner of Kragga Kamma Road and Lakeside Road. We are very excited about the new terrain and know that the Muckers (and particularly the spectators) are going to LOVE it.